Claude Cowans was driving a Ford on Highway 46 around 7:15 p.m. Saturday when he pulled over to the shoulder east of Golden Hills Road. Cowans, whose passenger was his 5-year-old daughter, then backed his vehicle into a BMW that a CHP officer had pulled over. The officer asked Cowans’ information and instructed him to wait. 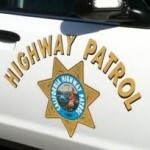 While the officer was recording Cowans’ information, the driver fled until another CHP officer stopped him on Golden Hills Road north of Creston Road. Cowans again fled, driving on Creston Road into Paso Robles, and ultimately crashing into a dirt embankment on the west side of Chestnut Street. Cowans suffered major injuries and his daughter suffered minor chest injuries. They were both taken to a local hospital. CHP officers did not suspect Cowan of driving under the influence, but noted that he was angry. What s ares me about people like this Cowan is that they can breed and they can vote. Do you think the CPS will take away his kid(s). Fleeing from police seems worse than having a messy home. And very, very STUPID! Who in their right mind would lead the CHP in a chase twice in one night??? The daughters physical injury doesn’t hold a candle to the real injury caused by her father. Breaks my heart.